where -J/j = 631.3481 when A K is in km/s and all of the semimajor axes are in km. As in step 1 above, aa = (rA+ rB)/1. To make the orbit change, we divide the A K into two small bums are of approximately equal magnitude. The result in Eq. (6-33) is more unusual than it might seem at first Assume that a satellite is in a circular orbit with velocity ViA. In two bums we increase the velocity by an amount A K. The result is that the satellite is higheT and traveling slower than originally by the amount AK We can best clarify this result by an example. Consider a satellite initially in a circular orbit at 400 km such that rA = 6,778 km and Vu = 7,700 m/s. We will apply a total AKof 20 m/s (= 0.26% of ViA) in two bums of 10 m/s each. From Eq. (6-34) the total Ar will be 0.52% of 6,778 km or 35 km. Thus, the final orbit will be circular at an altitude of 6,813 km. Immediately following the first burn of 10 m/s the spacecraft will be at perigee of the transfer orbit with a velocity of 7,710 m/s. When the spacecraft reaches apogee at 6,813 km it will have slowed according to Kepler's second law by 0.52% to 7,670 m/s. We then apply the second bum of 10 m/s to circularize the orbit at 7,680 m/s which is 20 m/s slower than its original velocity. We have added energy to the spacecraft which has raised the orbit and resulted in a lower kinetic energy but sufficiently more potential energy to make up for both the reduced speed and the added AK. Sometimes, we may need to transfer a satellite between orbits in less time than that ■ required to complete die Hohmann transfer. Figure 6-8 shows a faster transfer called the one-tangent burn. In this instance the transfer orbit is tangential to the initial orbit It intersects the final orbit at an angle equal to the flight-path angle of the transfer orbit at the point of intersection. 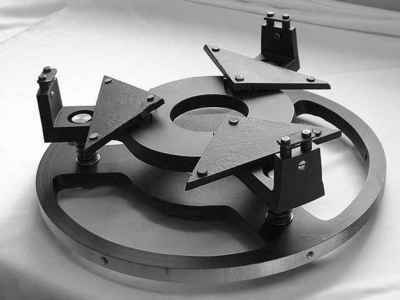 An infinite number of transfer orbits are tangential to the initial orbit and intersect the final orbit at some angle. Thus, we may choose the transfer orbit by specifying the size of the transfer orbit, the angular change of the transfer, or the time required to complete the transfer. We can then define the transfer orbit and calculate the required velocities. For example, we may specify the size of the transfer orbit, choosing any semimajor axis that is greater than the semimajor axis of the Hohmann transfer ellipse. Once we know the semimajor axis of the ellipse (aa), we can calculate the eccentricity, angular distance traveled in the transfer, the velocity change required for the transfer, arid the time required to complete the transfer using the equations in Table 6-5. Fig. 6-8. 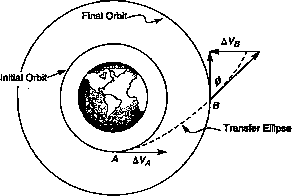 Transfer Orbit Using One-Tangent Bum between Two Circular, Coplanar Orbits.